If you kept track of all of your discretionary - free - time, by categories (watching TV, exercising, etc.) do you know what you spend the most time on? The Pareto chart is an easy way to determine where you are spending your time and where you need focus your time. Vilfredo Pareto lived in the late 1800s. He was an economist and developed a mathematical formula that demonstrated 20% of the residents of Italy owned 80% of the wealth. A search for "Pareto" returns around 2 million links. Terms such as Pareto chart, Pareto principle, Pareto distribution refer to the same idea: that 20% of activities or categories account for 80% of the collected data. What are the key issues we need to address? Where should our efforts be focused? 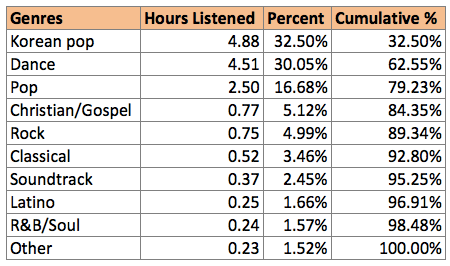 To illustrate the Pareto chart, below is the number of hours I listened to each genre of music on my phone. By arranging genres based on the number of hours listened in descending order, I quickly determined which genres contributed to the 80% of listening hours. 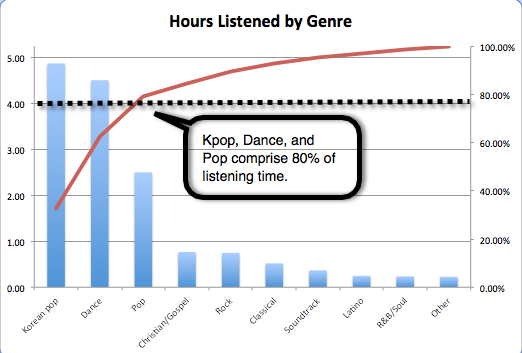 From my iTunes data, I can see that the majority of my listening time is spent in the genres of Korean pop, Dance, and Pop. Interestingly, I have most classical music in my library that anything else, but don't listen to it as much. Using light information like library statistics may not be critical. However, when you use the Pareto Chart to graphically depict how you spend your time, which regions of the country account for the most sales, or customer satisfaction ratings, the value increases significantly. In an upcoming post I will discuss the nuts and bolts of the calculations for the Pareto Chart and how to create it using popular software. If you found this post helpful, please comment below and share on Facebook.